The green leaves of this grafted multi-branched, compact cultivar grow closely together and other lap one another like shingles on a roof, producing a dense lead cover on a sculptural, nearly spherical form. In fall, brilliant fiery red leaves create a dramatic show. 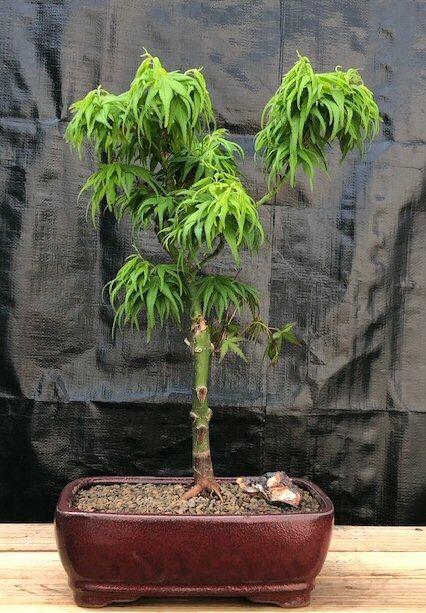 Ideal bonsai tree specimen. Hardy and easy to grow, this delicate Maple will look great on a patio, deck or garden. Provide sun in order to show best colors both in early spring and late into the season. Deciduous. Keep outdoors. 11 years old, 19" tall.